This book shows managers how to apply management science to gain the full business benefits of agility through application of the focused approach taught by Dr. Eli Goldratt's Theory of Constraints. A breakthrough approach to managing agile software development. 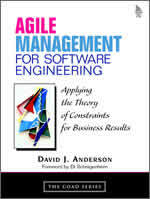 Whether you're a development manager, project manager, team leader, or senior IT executive, this book will help you to develop management discipline for all phases of the engineering process, implement realistic financial and production metrics, and focus on building software that delivers maximum customer value and outstanding business results.